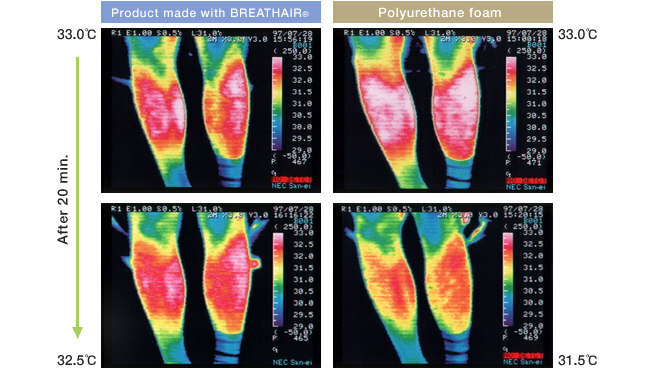 BREATHAIR® has low hysteresis loss and high rebound properties for a cushion material. When used in mattresses or in cushions, these properties make it easy to turn over with comfort. 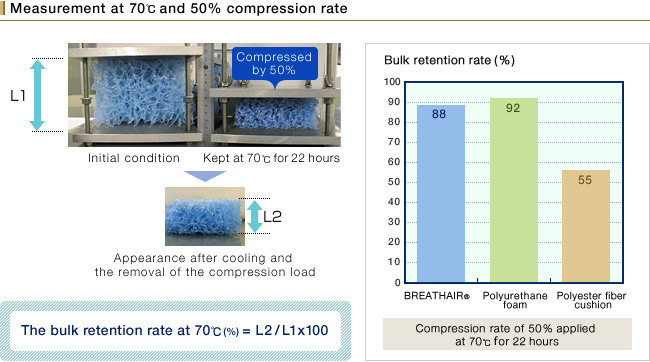 The durability of BREATHAIR® was tested using two different methods. BREATHAIR® displays air permeability on a remarkably higher level than that shown by polyurethane foam and polyester fiber cushion. Toyobo uses its skin model method to measure the temperature and humidity between the sleeping body and the mattress. These mattresses are cool in summer, and when wrapped in a mattress cover they can also retain heat and remain comfortable in winter. BREATHAIR® is quick to dry and is also washable. Polyurethane is still not dry 24 hours after washing. BREATHAIR® does not concentrate stress; it has outstanding load dispersal characteristics. The structure of BREATHAIR® is made up of a series of continuous fiber loops and as such there is no fiber dust which means that it is difficult for bed mites to propagate. Moreover, BREATHAIR® has excellent anti-bacterial functions as evidenced by BREATHAIR® meeting SEK standards. As BREATHAIR® is made from polyester-elastomers, even when it burns, the amount of toxic hydrogen cyanide gas released is small.